For the first time since 30 for 30 began in 2009, there won't be one after the Heisman Trophy ceremony. Over the years, one of the most-prized 30 for 30 slots has been after the Heisman Trophy presentation on ESPN. That slot has generally (but not always) gone to a college football documentary, and those post-Heisman documentaries have frequently been some of the most-praised editions and some of the highest-rated as well thanks to their strong lead-in. There’s been a 30 for 30 airing after the Heisman ceremony every year since the series started in 2009, but that trend’s going to change this year thanks to ESPN instead airing a Top Rank boxing match between WBO junior lightweight champion Vasily Lomachenko and WBA super bantamweight champion Guillermo Rigondeaux. It’s worth taking a look back at the different 30 for 30 editions that have aired in this slot over the years in terms of how they’ve been received critically and how they’ve done in the ratings. Here’s a breakdown, with synopsis and audience taken from the 30 for 30 Wikipedia page. Our ranking: Around 20 of 95 installments. The first round of 30 for 30 was six films. They were just hoping to get to 30. (Laughs.) The first few films didn’t rate well. They were really good, but the series wasn’t making the impression ESPN hoped. Plus they didn’t really know how to promote them yet. Synopsis: The rise, fall, and rebirth of the SMU Mustangs football program, which received a 1-year “death penalty” for major infractions after former SMU player David Stanley blew the whistle on the long-suspected program. You could easily add 30 minutes to the rise of SMU football and 30 minutes to the fall of the program to stretch it to a two night 3 hour installment. “Pony Excess” found success both in terms of critical acclaim and ratings wise and given how much meat was on the bone in terms of story there, I think it’s certainly a story that could have been stretched a bit more and not lose any potency. Synopsis: A look at the rise and fall of former USC and NFL quarterback Todd Marinovich, focusing primarily on the complex relationship between Marinovich and his father. Synopsis: A profile of Bo Jackson and how his college and professional feats in two sports (baseball and football) captured the public’s imagination and made Jackson a cultural (and marketing) icon. Synopsis: The stories of two Ohio State football figures connected with Youngstown, Ohio, running back Maurice Clarett (a native of the city) and coach Jim Tressel (former head coach at Youngstown State University), their football exploits at OSU (including a national championship in 2002), and their scandalous exits from the school. Our ranking and review from Ben Koo: Right outside the Top 10. …Ultimately I thought the film was quite good although the length and the depressing subject matter potentially could leave some not as impressed. …Although just outside the top ten, Youngstown Boys is the best effort from the fall 2013 batch and one that is a lot more ambitious in terms of themes and subject matter than a lot of the other recent 30 for 30 films. Synopsis: A sequel to The U profiles the Miami Hurricanes football program and its rise from scandal (and calls for the school to drop the sport) to a national championship, only to see new controversy after booster Nevin Shapiro is revealed to have given improper benefits to the program. Audience: 1.877 million (Not listed on Wikipedia. Data from SportsTVRatings). Our ranking and review from Ben Koo: Mid 40s out of 68. …Despite having high expectations, Billy Corben’s The U Part 2 closes out a very impressive 2014 of 30 for 30’s on somewhat of a lackluster note, once again proving that sequels are rarely better than the original. …This sequel felt even more like a Miami branding exercise, but this time with very little introspection, much slower, and covering a much less dynamic and less turbulent time for the program. Synopsis: A profile of the Buffalo Bills teams of the early 1990s, when the franchise became the first team to play in — and lose — four consecutive Super Bowls. Our ranking and review from Ben Koo: Mid 20s of 79. …Selected for the coveted post-Heisman ceremony slot which juices up ratings compared to other 30 for 30’s, The Four Falls of Buffalo mirrors the team it covers in that it never delivers a thundering climax during its consistently good to great run. 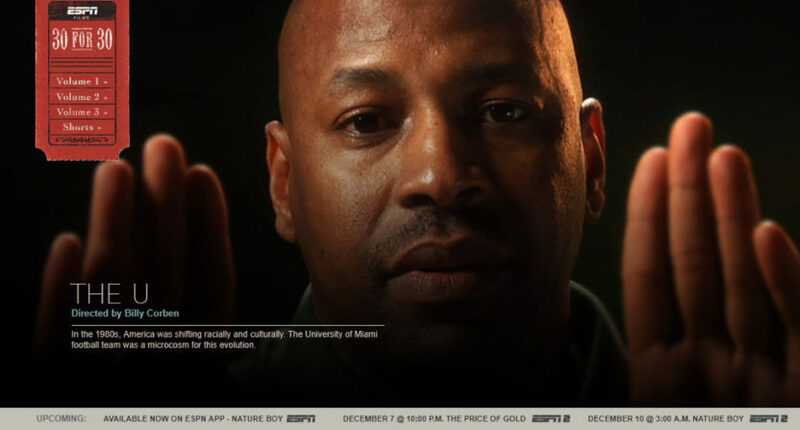 Synopsis: A look at the notorious 1988 Notre Dame–Miami football game and its personal and cultural impact. Creadon was a senior at Notre Dame when the game took place. His roommate that year was one of the people behind the controversial t-shirt that gave the game its name. Our ranking and review from Ben Koo: High 40’s of 87. …The story of the 1988 Miami vs. Notre Dame game is actually a pretty damn good story, one college football fans will eat up. And the game itself is actually retold really damn well. But where the film really struggles is the choppy one hour lead-up to the game where I think many viewers will struggle to stay engaged. So, overall, these post-Heisman films have been some of the best-rated (You Don’t Know Bo appears to be the highest-rated 30 for 30 ever, even beating OJ: Made In America Part 1’s 3.4 million on ABC, and many of these others have done very well compared to the usual 30 for 30 ratings) and best-reviewed installments out there. And they’ve also been some of the 30 for 30s with the longest running times, partly given the prestige of the slot. It seems unfortunate that ESPN won’t be able to use this slot for a big 30 for 30 this time around, but the ceremony should be a nice lead-in for the boxing fight. We’ll see what the next 30 for 30 airdate is.